Whether you prepare your own tax return or have an accountant manage your finances there are a multitude of to do’s and not to do’s to navigate when it comes to tax deductions. With this in mind here are five tips to remember about your tax deduction claims for the end of financial year. 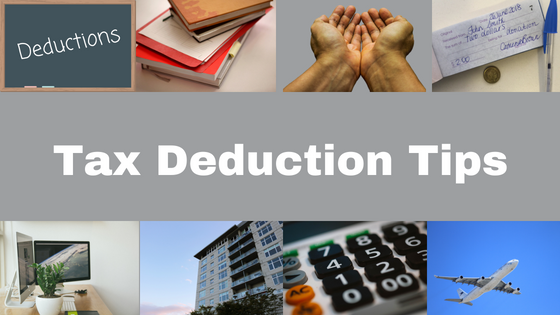 There are a range of work related deductions you can claim. However, you must ensure your claim is a legitimate business expense. Things you can claim include the cost of buying and cleaning occupation-specific clothing, protective clothing and distinctive uniforms. For example, a chef could claim the cost of dry cleaning a uniform required for work purposes. If you work outdoors, sunglasses could be a legitimate tax deduction. Similarly, if you use your personal vehicle for work-related travel, fuel and servicing costs are a legitimate deduction. However, don’t be tempted to get creative. A laptop bag is a legitimate expense where-as your handbag, which may also be used to carry your computer, is not. Also, multiple pairs of sunglasses would be questionable. For those that work from home as part of your job, you may be eligible to claim the costs of running your home office i.e. telephone, internet and equipment expenses. If you operate a home-based business, you may be able to claim the cost of using your computer, software, equipment, furniture, lighting, heating and a percentage of your rent/mortgage as a tax deduction. It is advisable to speak with your accountant in this situation for more specific advice and information. Income earned via other sources i.e. via Airbnb, Uber must be declared in your income tax. You can however claim deductions for expense incurred from providing such a service e.g. professional cleaning, fees, rates, insurance, vehicle maintenance. For more specific information about the Shared Economy, check out the CVW blog. When it comes to donating to your favourite charity, any money you contribute of $2 or more is tax deductible in the financial year you gift the money. Remember however, you must have a receipt. Travel – the ATO has published rates considered reasonable for accommodation and food expenses, however you cannot claim a deduction if you spend less than the published rate. Also, avoid making a travel claim for expenses that have not been incurred i.e. receiving a travel allowance but staying with friends instead. Self-education – any claim for self-education related expenses must relate directly to income currently being earned. Excessive claims for overseas travel and courses will need to be proven as expenses necessary for your current job. Any queries or questions, drop CVW Accounting a line on 9219 1300. This entry was posted in Advice, Tax Obligations, Tax Planning, Tips	and tagged #accountant, advice, CVW Accounting, EOFY, perth accountant, tax, tax deduction, tax deductions, tips .